Cultivate learning and create memories through The Center’s School Day Series! The Center’s School Day Series is a great fit for schools, educational groups and homeschoolers alike. Don’t miss out on this valuable opportunity to entertain and educate in a creative way! *Single tickets/tickets for homeschoolers MUST be purchased at the Box Office via phone or in person. Friday, October 5th at 10:00 & 11:45 a.m.
​This is one our very favorite, most popular shows, and we’re SO happy to have The Ugly Duckling return. 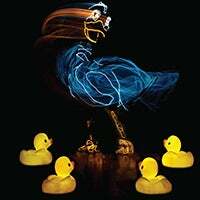 With luminescent puppetry and dance in the tradition of Disney’s Spectromagic, Lightwire brings the moving and heartwarming classic story of the large, gangly duckling rejected because he’s “different”. It absolutely breaks your heart when his family shuns him, and it is inspiring and joyful when they learn to accept him as he is, after he heroically saves his sibling from a wily cat. Using a variety of music ranging from classical to pop, with dance and cutting edge technology, Lightwire creates a beautiful and mesmerizing theatrical experience for all ages. 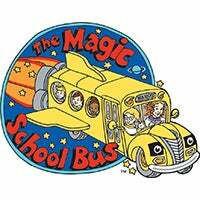 Thursday, October 11th at 10:00 & 11:45 a.m.
Theatreworks USA takes students on a trip with Ms. Frizzle in this musical based on the popular book series. When the class gets lost on a field trip to the Planetarium, Ms. Frizzle saves the day by blasting into outer space for an epic interplanetary field trip! But when rivalries among the students create problems, they all must learn to pull together or risk getting forever lost in the solar system. Dallas Children’s Theatre brings the coolest ever rock-n-roll romp in a bug’s world, with the droll humor and whimsy of the popular book series. 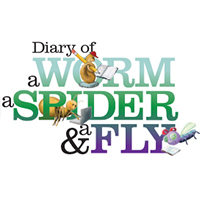 Worm, Spider and Fly are unlikely best friends. For example, Fly believes she has superpowers, and Spider can’t wait to grow up and molt. Promoting eco-consciousness, earth science and tolerance of others, this is a joyful, hip musical exploration of the world outside. Children will find that a bug’s life isn’t all that different from their own! 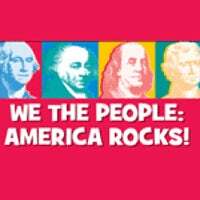 Theatreworks brings a musical revue with America’s original “boy band”, the Founding Fathers! Washington, Adams, Jefferson and Franklin trade in their powdered wigs for power chords to bring American Civics lessons that are exciting and accessible. The “Fab four” explain our system of government, while showing how important good governance is. Using humor, rock, hip-hop, rhythm & blues and dance with typical teenagers, this is a painless Social Studies lesson. 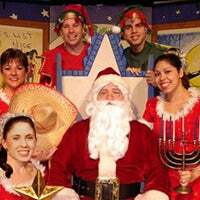 In its 17th year of touring, this fast-paced musical is a joyous review of the world’s dances, songs and stories from Christmas, Hanukkah, Kwanzaa and many other holidays. Students will sing, clap and tap along as they learn new and old traditions, customs and folklore found in celebrating the holiday season. This jubilee creates a memorable and heart-warming experience that highlights the true spirit of cultural diversity, and includes an outstanding Study Guide detailing the many holidays celebrated. Ms. Greer’s classroom includes three inquisitive out-of-the-box thinkers: Rosie Revere has big dreams, Iggy Peck has a passion for architecture and Ada Twist’s curiosity can drive her teacher crazy. 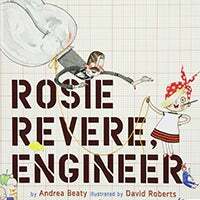 Theatreworks brings a fun new musical based on Andrea Beaty’s popular books “Rosie Revere, Engineer”, “Iggy Peck, Architect” and “Ada Twist, Scientist”. These appealing and amusing characters bring the joy of the STEM curriculum to life with Theatreworks’ usual top notch clever production. In the Science of Sound, Michel Lauziere’s makes (and plays) hilarious homemade musical instruments, punctuated with short, simple but instructional explanations about sound and how it works. 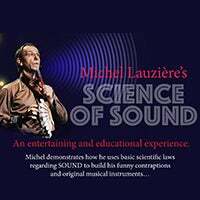 While entertaining the audience, Michel shows that he uses basic scientific laws to build his bizarre, funny contraptions, and is actually using practical applications of frequency, amplitude, resonance, etc. Including plenty of audience participation and humor, he makes the “science of sound” fun and exciting! The Caldecott Medal Winning book by Philip and Erin Stead is brought to life in a fun, rousing new musical from Virginia Rep. Amos McGee is a kindly and conscientious zookeeper who bonds with each of his animal friends- races with the tortoise, spends quiet time with the timid penguin and always carries a handkerchief for the sniffling elephant. So… when Amos is out sick one day, the story of the animals’ efforts to reciprocate his kindness makes for an entertaining and heartwarming musical. After much popular demand, that little caterpillar is returning, along with an assortment of favorite puppet characters. The triple-bill includes the story of The Very Hungry Caterpillar’s metamorphosis into a beautiful butterfly, the fanciful account of Little Cloud’s travels through the sky, and the Mixed up Chameleion’s discovery of his own unique nature. These whimsical tales have enchanted several generations, and Mermaid’s gentle, acclaimed stage adaptation teaches besides entertaining. The characters from the popular Pete the Cat book series comes to us via Theatreworks USA’s delightful musical. The story begins when the cat-catcher sends Pete to live with the Biddle family to improve his manners. Pete soon has the whole family rocking, except for young Jimmy, the most organized second grader on planet Earth. But when Jimmy has trouble with his art project, Pete is the perfect friend to help him out. Children will learn a little about artistic inspiration and friendship, while having a great time at this clever musical. Just like the beloved tale of E.T., ArtsPower’s newest musical tells us about a friendship between a stranded Alien child and a little boy. They go to school, explore the neighborhood and have lots of fun, but at bedtime, the Alien suddenly grows very sad and misses his own family. This funny, heartwarming musical teaches the value of friendship for all ages.